Hi everyone. Here's my DT card is for today's challenge at Addicted to CAS. Remember, the challenge runs for two weeks, so there's lots of time to enter!! I added an acetate panel between two layers of the window die to create the "glass" for the window. I then added Martha Stewart's Sparkle Texture Effect on the four glass panels, along the top of the window and window box for snow. Inside, there is a decorated Christmas tree with ornaments and a glittery star at the top and I sponged the walls in a nice, warm yellow. 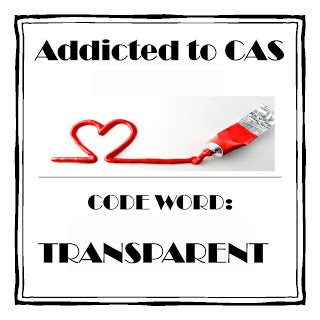 I hope I have inspired you to join in our fun challenge ... Addicted to CAS - Transparent. Come check out all the wonderful creations by the other Design Team members. Beautiful card, Loll! I love the window panes...the snow is just perfect! What a beautiful embossed background too! So pretty...I love the glow ...you are a master. So pretty Loll - love the snow in the windows and the brickwork. Fab. 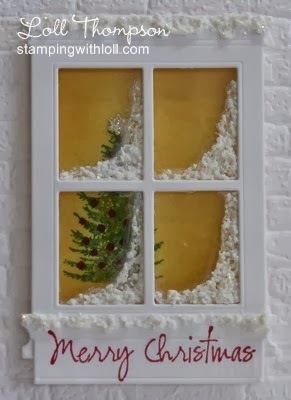 Adore the snow on the window -- AWESOME card! What a beautiful window, Loll! I love the snow and the warm glow inside! Very welcoming! Wonderful card, Loll! Love the simplicity of the white and the yellow with just a hint of red and green. Your window cards are always so well done! Wow! Another beautiful and inspiring card. I would like to thank you again for helping me in my quest to submit my cards correctly. It has taken me almost three months but I think I now direct people to the card and not my blog. It is much easier using the PC than my husband's MAC. And thanks to you and my granddaughter I think I have mastered my blog entries. Next is taking much better photos of the card. Gorgeous card Loll, Love the love the warm look to that room, and the sparkly snow. I really must have that Brick folder too..I keep forgetting to go look for it. This is simply fabulous Loll - the Christmas tree inside the house looks so beautiful through the snowy window panes. Perfectly displayed on the embossed background. Love it! 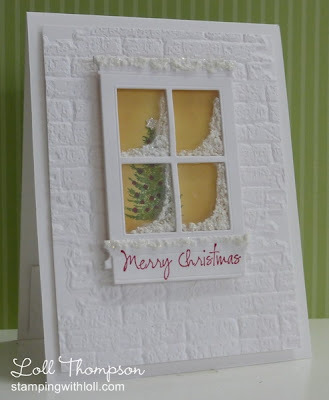 Your card is beautiful Loll, I love the yellow background and sparkle around the window frames. Loll, this is an amazing chistmas scene. I would never have thought of a "real" window - so so cool! Loll this is stunning!! I love window scenes, and this is so beautifully created!